Please submit information and photos to help this site become more useful to everyone. This website intends to become, in time, the world's foremost collection and gallery of hot air airship history and current information. The stories, photos and artifacts contained within (and to be contained) have largely been untold, and it is the aim of this site to preserve the rich history of thermal airship projects for future generations of pilots, crew, designers, builders and enthusiasts alike. As well, this website will eventually attempt to list as many current and historical hot air airships as possible in a database/gallery format. Evidence in my collection shows that there have been at least 218 different manned hot air airships constructed since 1973 (but not all necessarily have flown successfully). There certainly may be more, and one of the goals of this website is to allow others to help expand my research. If you find yourself able and willing to contribute to preserving the history of hot air airships around the world, please send me your materials and recollections to be added. Contributions may be credited or confidential, as you wish. This website would be absolutely impossible without the expert assistance and contributions of countless members of the Lighter-Than-Air community, many quite notable in their own right. A credits page will soon recognize their efforts. If there are any questions about contributing, most of them can be answered for now by visiting The Early Years of Sport Ballooning, checking out the FAQ's section and applying the concept to this site. 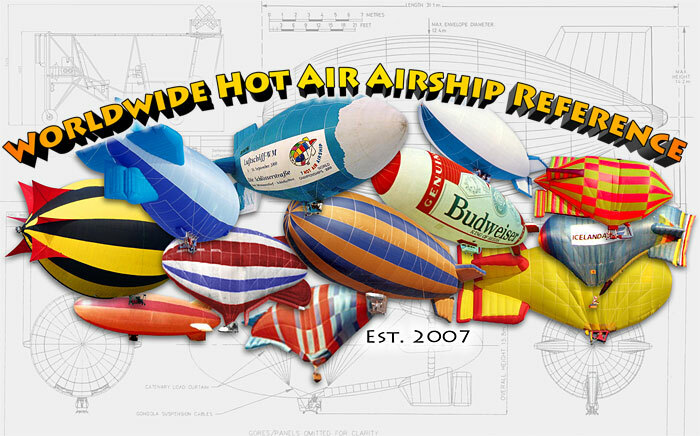 Lastly, anyone with hot air airships for sale (or associated equipment) may email me, and I will be glad to put them in touch with potential buyers. Tyler / The Blimp Co.